So on Monday Nvidia revealed their new GPU architecture codenamed Turing, although so far only in form of professional Quadro cards, gaming cards based on this new arch are apparently behind the doors too - to be revealed next Monday on GamesCom. Anyone in for GPU upgrade? It is rumored that new 2080 will be even faster than Titan V, at least in Ashes in Singularity. Which is kinda feature, as Titan is a massive chip sold for exorbitant price. Personally, i am incredibly curious, especially cause of the new RTX technology. Hopefully it will be present in these gaming cards and its not reserved just for those expensive Quadros. Anyway, will we be getting raytracing for Ashes? Since there was so much talk, how that game is all around technological "etalon" - and no doubt it is - it would be awesome if it added this feature, since i suppose it would improve the visuals even further. Well... one thing you can think of... The 2080Ti is currently priced at where the 1080Ti was about 6 months ago. Now that RTX2080 is in the market for a while, I hope that 1070 and 1080 becomes more affordable. I am finally going to have it tomorrow...after almost 2 months of waiting for them to be available around here. Next week possibly another one for some SLI goodness - although all of it for work, not really for gaming. For that purpose i would be all right with my current 1080, the only games i played recently are SCO and Black Ops 4 anyway...both running already at acceptable framerates. So it took more than 3 months since announcement, but eventually here i go - finally. 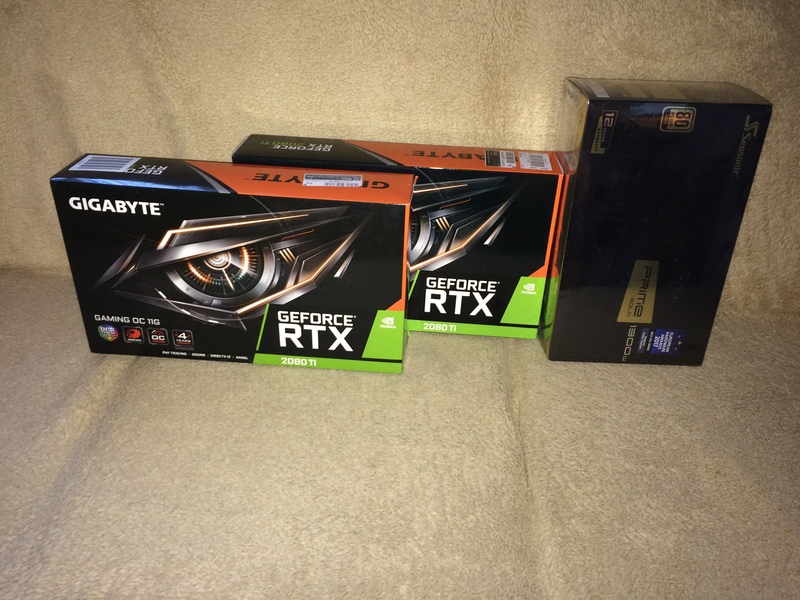 Cost me 1100 EUROs for one of the cards + about 150 for the PSU, the other card i got as reward for few of my side-jobs instead of money, so it did cost me just my free time. Not that bad, especially given the fact i am gonna use these for work, so they earn me those money back. Hehehe, OK. I will better set-up some forcefields around my room. Definitely going to buy NVlink bridge, not for gaming though, but to give me possibility of having 22GB framebuffer for archviz rendering. Don't feel bad, the RTX Titan just got announced a few days ago for $2,500 USD. More importantly, rendered my first project - some kind of wine storage interior - and it was blazing fast. It took like 2 minutes to render 1000 Ms per pixel, which after denoising were at 2560x1600 pretty much good enough as final renders. This will save sooo much time. As far as gaming goes, one 1070 runs everything at 1920x1080 res which is all we need. Hell, my previous card (AMD HD 7970) did just fine at that res too on current-ish games. I really don't know why I would consider upgrading or buying more cards (I have 3 1070s now), except for mining cryptocurrency. Maybe younger gamers (who don't remember playing games just fine at 640x480 in all its VGA 256 color glory) need 1440p or higher -- I certainly don't. God, I hate to be that guy, but I guess I am. :/ In fact, I would be happier at 1680x1050 with 16:10 aspect ratio for more height. But 16:10 lost the aspect ratio war long ago, and we just have to move on and make do with 16:9. A shame.